This beautiful cape is embroided with flowers in the front, back and at the hood. Its in good vintage condition. one size Please note that vintage items are not new and therefore might have minor imperfections. A beautiful vintage coat in Christian Dior's new look style. It is in good condition for its age and very heavy and warm. 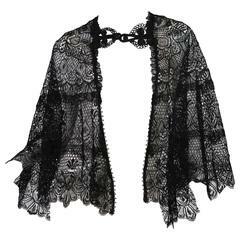 Victorian French Lace Cape purchased in Paris.